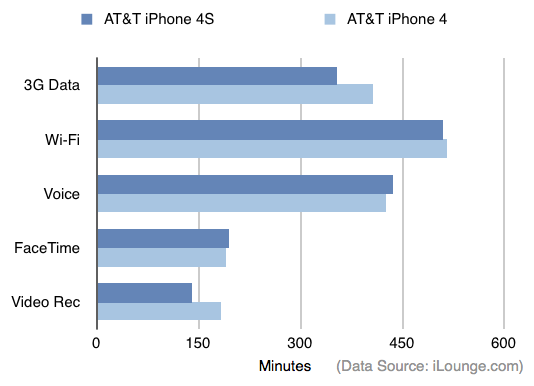 iLounge publishes their review of the iPhone 4S and provides one of the more extensive battery comparison testing we've seen for the new model. There's been some ongoing debate in our forums about how the iPhone 4S's battery compares to the iPhone 4. In Apple's official specifications, the company claims the iPhone 4S has an improved talk time but worse standby time as compared to the iPhone 4. iLounge put the two devices to the test. For tests with 3G Data, Audio Playback, Video Playback, and Video Recording, iLounge found that the iPhone 4S came in under the iPhone 4's battery life times. For Wi-Fi and FaceTime testing they found it to be similiar to the iPhone 4, and on Cellular Calls, they found the iPhone 4S slightly better. One interesting finding with 3G data was that while their Verizon 4S unit ran for the same time as the AT&T model (~ 5 hours and 54 minutes), they found the Sprint model to lag at 5 hours and 23 minutes. Comparisons across mobile providers may not be completely fair due to differences in signal strength which could impact battery life. In voice calls, they found the AT&T iPhone 4 and AT&T iPhone 4S to have comparable times of around 7 hours and 6-16 minutes. The Verizon 4S model, however, showed a surprising 8 hours and 27 minutes, while the Sprint 4S again lagged at 6 hours and 27 minutes. iLounge notes that the Verizon model may have shown 4 bars more often than the other two. Both media playback and recording has taken a hit on the iPhone 4S as compared to the iPhone 4. For video recording, of course, it should be noted that the iPhone 4S is recording much higher resolution video than the iPhone 4. If you spend much of your day near a Wi-Fi network and only rely upon the iPhone 4S for web browsing and phone calling, you won’t notice a major difference—unless you’re thinking of switching to Sprint, in which case we’d be a little concerned. Similarly, if you use 3G data, plan to record or play videos, or want to listen to hours of audio during the day, you can expect greater battery drain from the iPhone 4S. As we mentioned, there may be some confounding data due to regional signal strengths, but given the other complaints about Sprint's data speeds, it still seems to be the worst choice amongst the iPhone carriers. iLounge's full review covers many other areas and is worth a read. Now, we should note that some users seem to have been experiencing dramatically decreased battery life on their iPhone 4S. One solution to that is said to be the calibration of the battery, in which case you drain your entire battery once and then charge to full. Some have found their battery gauge to be inaccurate until this is performed. Apple includes other tips on their site about improving your battery life on the iPhone. 4 million suckers got dragged into purchasing the same phone 2 years running. Only to find that battery has gone backwards. Most of you geniuses dont realise that battery should get better with performance gains. Every generation the power usage goes down with performance going up. Basically the A5 is just a clocked up CPU with a better GPU. iPhone 4S = Cash Cow. Lower costs and higher margins make stock markets very happy. My iPhone 4 has gotten faster with IOS 5 so i doubt the performance gap everyone is seeing is all to do with the A5. I don't know where you got your engineering degree but you should ask for a refund. The A5 is just a clocked up CPU over the A4?? LOL, good to know you haven't educated yourself on the hardware at all. I salute you, Captain Obvious: Protector of the Already Known! Was this with iOS 5 on the iPhone 4? Not clear from the article. I've noticed significantly reduced battery performance under iOS 5. Top of my suspect list is the new location APIs being a much bigger overhead. I upgraded to the iPhone 4S from the iPhone 3GS and I noticed that the battery seems to drain much faster; even faster than a phone I've had 2 years. I can't compare it to the iPhone 4, as this article did, but I'm glad to see I'm not the only one who thinks the iPhone 4S drains the battery more. I haven't tested it extensively enough to really make a firm conclusion. But I'll be interested in reading what other people observe in their day-to-day usage. You can't expect the battery to be better with a Dual Core Processor in it. LOL what else would you have me say? He's just pointing out your guaranteed disposition to applaud Apple regardless of their decisions. "Apple releases redesigned iPhone 5 with 4" screen and tapered aluminum design"
Way to go Apple. This is why the competition will never catch up. Apple will always be the leader in innovation, this phone proves that. They could have easily just given it the new A5 and improved cameras, but they didnt stop there. This new design really takes the iPhone to the next level...larger screen and consistent battery life is better than anything else out there. Mean while, all the Android garbage is just doing spec bumps. Post PC-Era here we come. "Apple releases iPhone 4S with A5 and improved camera"
Incredible. Apple really made the right choice here: Improve upon a perfect phone. Let's be honest, a redesign wasnt the best thing now. When all the competition is scrambling to release bigger and bigger phones, Apple stays away from a fad and delivers a perfect 10 again. The A5 and Siri are huge game changers. Pick out a coffin now Google/Microsoft/RIM.